The polymerization of C5 fraction without separation and concentration by using a commercial available Nd(P204)3/ AliBu3/AlEt2Cl has afforded for the first time a new kind of 1,3-pentadiene-isoprene random copolymers as rubber materials. Isoprene (IP) and E-1,3-pentadiene (EPD) acted as polymerization monomers, cyclopentadiene acted as poison, and other substances like alkanes, monoolefins, Z-1,3-pentadiene acted as solvents in this multicomponent C5 fraction polymerization system. The data of kinetic experiments, NMR, and DSC indicated that the polymerization of C5 fraction by Nd(P204)3/AliBu3/AlEt2Cl afforded the IP-EPD random copolymers. 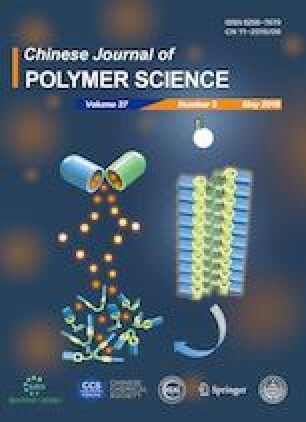 By controlling polymerization conditions such as [Al]/[Nd]/[Cl] molar ratio and polymerization temperature, the random EPD-IP copolymers containing high cis-1,4-poly(IP) (with selectivity 96%) and moderate cis-1,4-poly(EPD) (with selectivity 60%) units with a low glass transition temperature (about −60 °C), controllable molecular weight (Mn = 3.8 × 104‒14.3 × 104), and moderate molecular weight distribution (Mw/Mn = 2.17‒2.78) were obtained in a high yield. Supplementary material is available for this article at https://doi.org/10.1007/s10118-019-2244-x and is accessible for authorized users. This work was financially supported by the National Natural Science Foundation of China (No. 21674016).